The origin of this quote is highly contested, but its meaning is clear — those who hold strong in their beliefs are less likely to stray down the path that’s wrong for them. 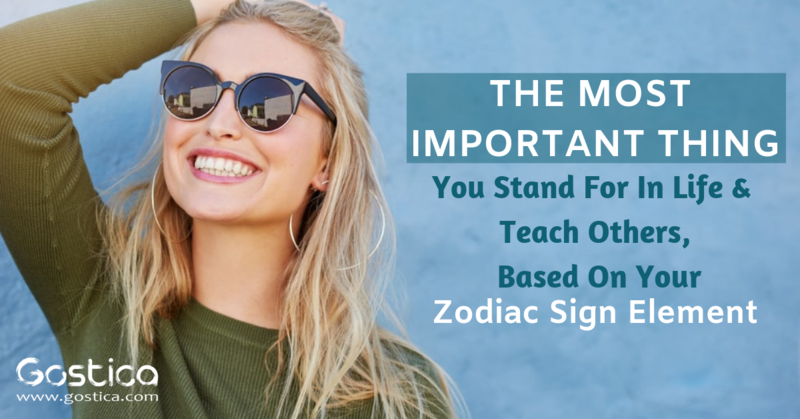 We all have that one thing that we believe in wholeheartedly and it powers us through each day, and that belief is in part influenced by astrology. There are four elements in astrology: Earth, Fire, Water, and Air. Each element houses three of the zodiac signs and plays a role in determining each astrological sign’s personality — including their belief systems. We can all learn some life lessons from these elements and the beliefs that guide them. These signs believe in not giving up until every possibility has been thoroughly acted upon. They believe in living their best lives because this group usually has big dreams and even bigger ambition. When life hits these signs, they fire back with enough ammunition that could make even the strongest of forces fall back due to their lack of preparation. This group teaches us how to fight back, how to stare fear right in the face and not even flinch, because they teach us to believe in ourselves more. Fire signs display a high level of perseverance and an even higher level of integrity and fearlessness. They teach us how to get out of our heads and just do the dang thing already. These signs strive for stability in their lives as much as possible. They believe in combating life’s curve balls through their structured, carefully planned, and system-like problem-solving perspectives. Earth signs believe in maintaining impeccable work ethic as they are the entrepreneurs of the zodiac. They teach us how to benefit our lives through investment and financial advantages. This group is also prone to staying grounded and as level-headed as possible. They don’t believe in getting a big head after their successes are achieved, they don’t believe in showing off what they have for you to notice what you don’t have; they don’t believe in ego. This group teaches us how to achieve something while still holding onto our integrity. Earth signs display the highest level of fascination and appreciation in the simple things this life offers. They teach us simplicity at its best. These signs believe in achieving the highest level of communication and mental skill. This group is full of intellects, humanitarians, and public speaking champions. This group is by far the most comfortable in the public eye. They believe the world is their home, that’s why you will always find them talking to everyone and anyone that catches their attention. Air signs love to learn and consume information that they didn’t know before. The way these signs equip themselves against life’s unfortunate events is with the knowledge and information they’ve collected. For example, if they’ve had a bad day, the way they pick themselves back up again is by remembering what they read somewhere of how a bath with Himalayan salt rejuvenates their skin to give them a full glow again. Air signs teach us how to stand up for ourselves in ways that can make everyone in the room listen because they teach us the beauty in overcoming our fears to speak up for those who can’t. This group believes in the good that still exists in the world because they believe in being good people. That’s why you find most of them volunteering in animal shelters, crying when watching a sappy chick flick, and demanding a strong emotional connection if you want to be someone of significance in their lives. These signs are known to be introverts and pretty quiet people, however once you’ve gotten to know them, they will astound you with their beautiful souls. Water signs are the most sensitive of the zodiac because they feel everything every one of us feels daily. This group teaches us that there are always other ways to emote how you feel rather than fuel it into violence, vulgarity, or complete nuisance. They teach us that there is pure strength in allowing ourselves to be vulnerable every once in a while.